What if we could tamper with time? That’s the question uppermost in the mind of Dominic Sandbrook (aka Sandy), in the fourth and final instalment of his BBC documentary series, Tomorrow’s Worlds: the Unearthly History of Science Fiction. The programme was a predictable but nonetheless enjoyable romp through some of SF’s more familiar time travel tales. 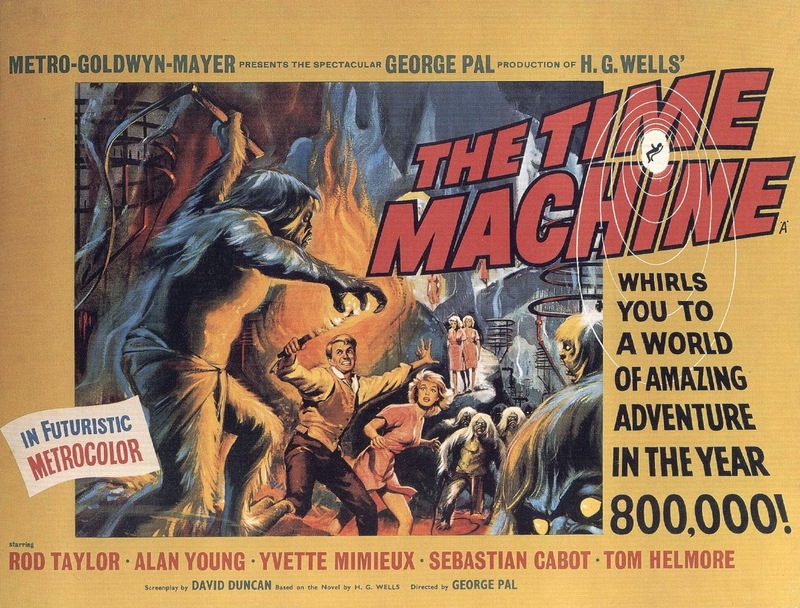 Sandy begins, of course, with the HG Wells classic, The Time Machine. Ignoring the novel’s origin in the short story, The Chronic Argonauts, written in 1888, Sandy suggests that time travel begins in 1895 with Wells’ novel. Curiously, he characterises The Time Machine as an attempt to explore the discovery of spiritualism, and the frontiers beyond. I found this one of the strangest assertions in all of Sandy’s four programmes. On the contrary, The Time Machine has two major themes: evolution and social class. The book is an ingenious voyage of discovery through the invention of a machine, which symbolises the power of science and reason. The Time Traveller sets out to navigate and dominate time. His discovery? Time is lord of all. The significance of the story’s title becomes clear. Man is trapped by the mechanism of time, and bound by a history that leads to his inevitable extinction. It’s not surprising that Wells had these twin obsessions of evolution and class. Firstly, Wells had emerged from an English lower middle class, that had previously spawned only one other key author – Charles Dickens. Wells’ mother had been in service, his father a gardener. Though they were hopeful of elevating their status on becoming shopkeepers, the shop failed, year after year. Wells’ own employment began as a draper's apprentice. It ended rather abruptly when he was told he was not refined enough to be a draper. Such rejection at the sharp end of a class-conscious Victorian England became the motivation for Wells’ critique of the world. Secondly, Wells’ scientific watershed had come on meeting Darwin’s Bulldog at the Normal School of Science, later the Royal College of Science, whilst studying evolutionary biology under the great TH Huxley. With Huxley as his inspiration, Wells began as an author, living in the dark, lanterned, black macadam streets of Victorian London, engine-room of the British Empire. The first of Wells’ seminal novels, The Time Machine, plotted a dark future for Man. The book was a sceptical view of the devilish enginery of progress and imperialism. It was an instant triumph. In Wells’ book, the Traveller’s headlong fall into the future begins at home. The entire voyage through the evolved worlds of man shows little spatial shift. The terror of each age unravels in the vicinity of the Traveller’s laboratory. “It is not what man has been, but what he will be, that should interest us”, Wells had written in his essay, The Man of the Year Million. In The Time Machine we have Wells’ answer - a vision calculated to “run counter to the placid assumption … that Evolution was a pro-human force making things better and better for mankind”. So, rather than Sandy’s assertion that the novel was about spiritualism (a notion he contradicts later in the same programme), Wells foresaw a bifocal future. One image in the lens, “upper-world man had drifted towards his feeble prettiness”, focuses on what man may become when natural selection is eradicated, as with the Eloi. The lens of the Morlock future, “the under-world [of] mere mechanical industry” arises when industrialisation serves as a chronic condition for natural selection. Wells’ warning is all the more powerful for making the reader feel responsible. It is the inequity of contemporary class society that leads to such monstrous futures. And the condition is still, of course, relevant today. Perhaps Sandy’s greatest omission in this programme was the science fictional obsession with alternate histories. They were hardly mentioned. He did, however, comment on the use of time travel as a vehicle for sharp social criticism. Perhaps this is why Sandy left out alternate histories, as even a cursory examination of this sub-genre finds a very conservative tradition indeed. Invariably, the alternate history and counter-factual stories tend to portray a dystopian world so much worse than ours that, as with Orwell’s flawed masterpiece Nineteen Eighty-Four, the unrelieved portrayal of misery tends to reinforce passivity, rather than undermine it. They leave the reader resigned to believing, like Voltaire, that we live in the best of all possible worlds. And we don’t.